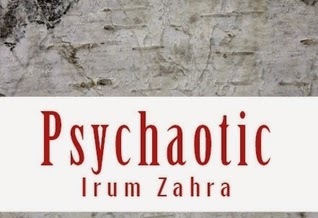 Psychaotic: See The World In Red And Black by Irum Zahra is available at Amazon, Barnes and Noble, and BooksAMillion. Psychaotic journeys through mind of a sad soul who is inclined towards the dark side to find escape from the horrors of life. It mirrors the struggle between illusion and reality and guides the true self into the mountains of hallucination. This book is for the misunderstood, the bipolar insane people who veil themselves with sanity masks. It is for you, the reader, who is away from his own self. A collection of poetry (and an essay or two) revolving around emotional topics, depression being a common theme. Stop Me gives voice to a feeling common among depressive disorders. The stark simplicity of Seer, A Rare Absence, and Impatience make them strong (lost) love poems while several poems, like Vendetta, Depiction, and Prize Possession, express violent ideas that women have rarely been allowed to express. The poems vary in style and format, with only a couple poems structured around a rhyme pattern. The rhyming poems are among my least favorite; the patterns feel too concocted, particularly when pitted against Zahra's freeform poetry. My favorite line from this book doesn't come from the poems but from the afterward by Irum Zahra: "P.S. Find the words written for you and let them resonate in your mind and heart." For me, that would be Roses on My Arms. The tattoo on my left arm is a full sleeve composed of roses, clouds, and bats that cover some of my own self-inflicted scars (and that's all the spoiler you'll get about the poem). But Shambles of Innocence runs a close second to being my favorite poem because it's the strongest "woman-poem" in the book.